Young at heart, child-like spirit, man child....if these concepts conjure up an image of your bae, your son, your brother or your buddy, these great gift ideas are for you. Think adventure with a touch of whimsy, jolly sprinkled with a little goofy. These gifts will warm his heart, and there is no one more deserving. Thrill seekers and nature lovers alike will enjoy the view from above in this lightweight tree tent. This gift includes everything you need to get off the ground and away from it all. Whether worn out in the elements or after a day on the mountain, who wouldn't want to revisit those cozy onesies from childhood when they look this good? The young and the young heart will be thrilled with their snowball making and throwing capacity while their friends should prepare for an ambush! Make their season bright with this battery operated, whimsical canvas delight of the man in the big red suit. 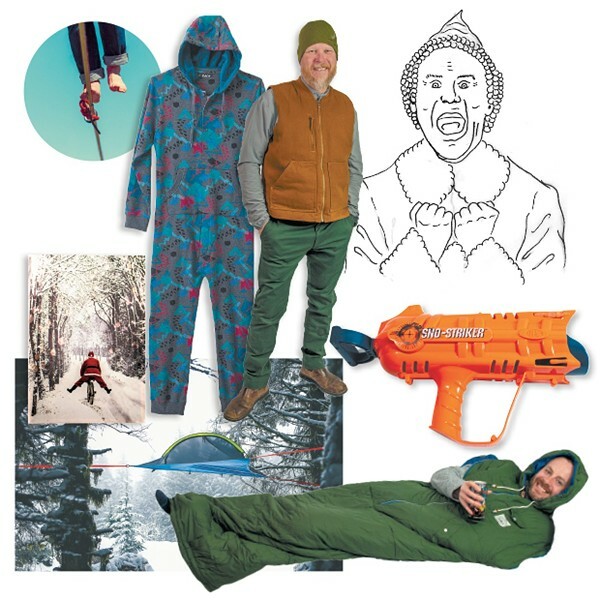 Dress your jolly dude in stylish duds that go from outdoorsy to winter festive. It's cheap, it's challenging, it will train your muscles and encourage balance. A great gift for someone who has a chipper outlook on life and is down to try anything. This wearable sleeping bag, (yes, we said wearable sleeping bag) is a no brainer for a guy who likes to camp, go to festivals, hit the slopes or just chill on the couch, so pretty much every guy, ever.